Sweet Potato Pie with Parma Ham and Robiola Cheese. It seems that spring has sprung early this year, and during those warmer days, why not soak up some glorious sunshine with an outdoor lunch or al fresco dining. Parma Ham – 100% natural with no added ingredients – is the perfect product to pair with an array of foods for a fresh and flavourful taste. 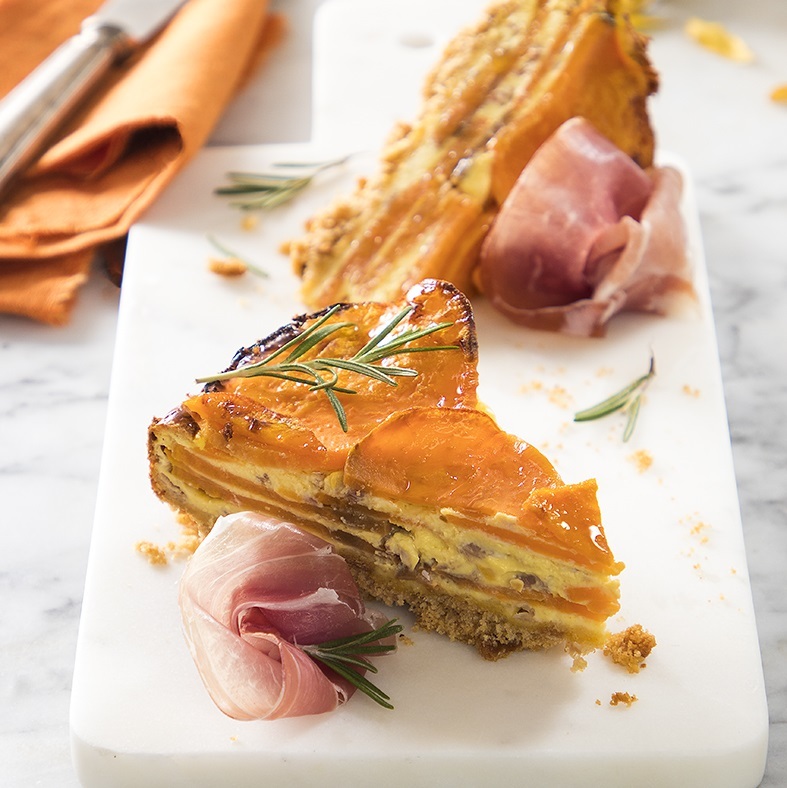 This recipe for sweet potato pie with Parma Ham and Robiola cheese is the perfect dish to celebrate the arrival of spring. Enjoy it in the sunshine or make it for an evening of entertaining. This recipe serves 8 - 9 people. Peel the sweet potatoes and cut them into slices about 2-3mm thick. Boil for 5-6 minutes in slightly salted water. Keep checking to ensure that the potato slices do not crack. Drain and place the sweet potatoes on a flat surface to cool. Cut 50g of Parma Ham into strips and then set aside. For the base, mix the ground rusk with the melted butter then place in a 22cm mould that is lined with baking paper. Ensure that the bottom of the mould is covered. Soften the Robiola cheese with the cream and then add in the eggs, salt, pepper, corn starch and the strips of Parma Ham. Mix thoroughly. Pour one third of this mixture onto the base in the mould. Spread one third of the potato slices over this mixture and add a pinch of salt. Repeat this process for two more layer of mixture and potatoes, ensuring that the top layer is your last third of potatoes. Brush the top layer with oil and flavour with pepper and rosemary. Bake at 170°C for 25 minutes, then grill at 200°C for 10 more minutes to brown the surface. Remove from the oven and leave to cool for 15-20 minutes. Place onto a serving plate and garnish with the remaining slices of Parma Ham and the rosemary. The unique taste of Parma Ham is dependent on the traditional production process passed down from Roman times, carefully controlled by the Consorzio del Prosciutto di Parma. Only hams that have passed stringent curing regulations approved by the EU can be awarded the stamp of the Ducal crown – a five-pointed coronet logo with PARMA in the centre which is branded onto the ham's skin. The Ducal Crown is now a certification trademark. For more information, please visit Prosciutto Di Parma. Guest post from Consorzio del Prosciutto di Parma. This recipe is a stunner, please link it up if you have a chance, it puts my pathetic attempt at a healthy chili cheese dog to shame.